I love me some enchiladas. Sometimes when I’m trying to save myself some time by not individually wrapping each enchilada, I’ll make a casserole instead. It’s got all the same great flavors but it saves you some time which I think is always a win, especially when I’m tired after work and don’t want to do anything but veg out on the couch watching tv. 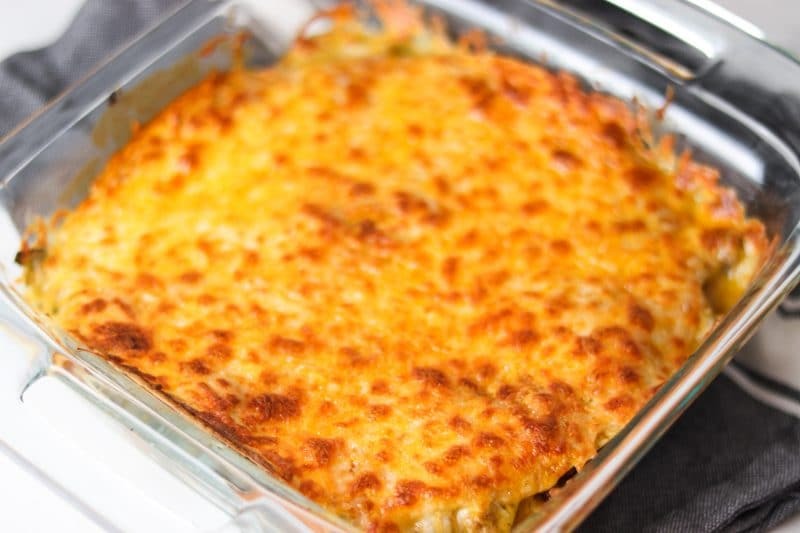 I made my Enchilada Casserole as a low carb version using low carb tortillas BUT there are a lot of different options for what you can use and it really depends on preference! 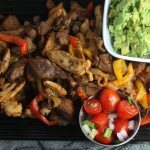 If you aren’t worried so much about carbs, you could use Siete tortillas for a paleo version of this or just use regular tortillas! Corn or flour would work just fine and be delicious, I assure you. As for me, I tend to prefer using either low carb tortillas or the lavash bread. They really soak up all that sauce and create a delicious and flavorful meal. 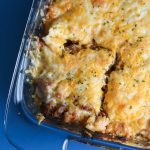 This casserole makes great leftovers and might even be better the next day plus it’s super easy to feed a crowd, just scale the ingredients! 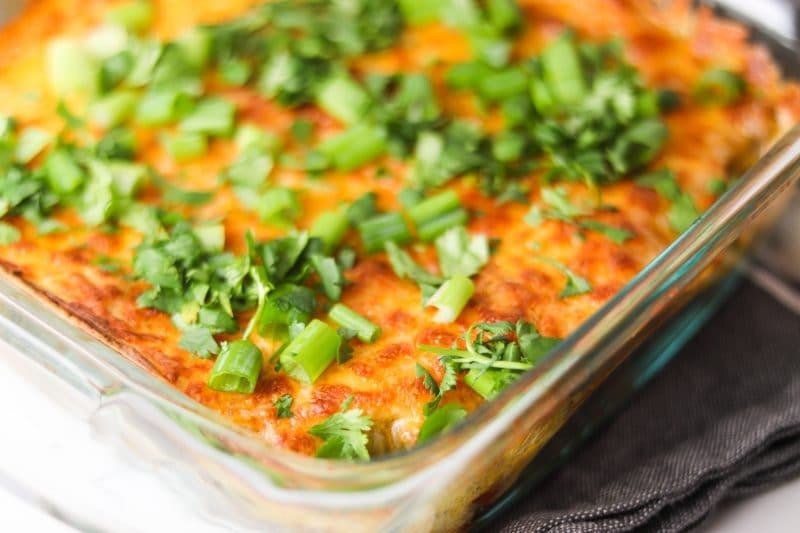 I love making casseroles when we have people over because it’s a hands off way to feed a lot of people a delicious meal without having to be stuck in the kitchen. I get to spend my time interacting and enjoying everyone’s company and we all still get to enjoy a great meal! Serve with a side salad, some cauliflower rice (or regular, or some Avocado and Bell Pepper Salad. In a pan over medium heat, add some olive oil then add in the onion. Let sweat for 2-3 minutes then add in the bell pepper and cook another 2 minutes until starting to get some color. Add in the ground beef and break apart with a spatula. Add in the spices and mix to combine well. Cook beef until no longer pink. Add in a little bit (about 1/4 cup) enchilada sauce and stir in then set the beef to simmer. 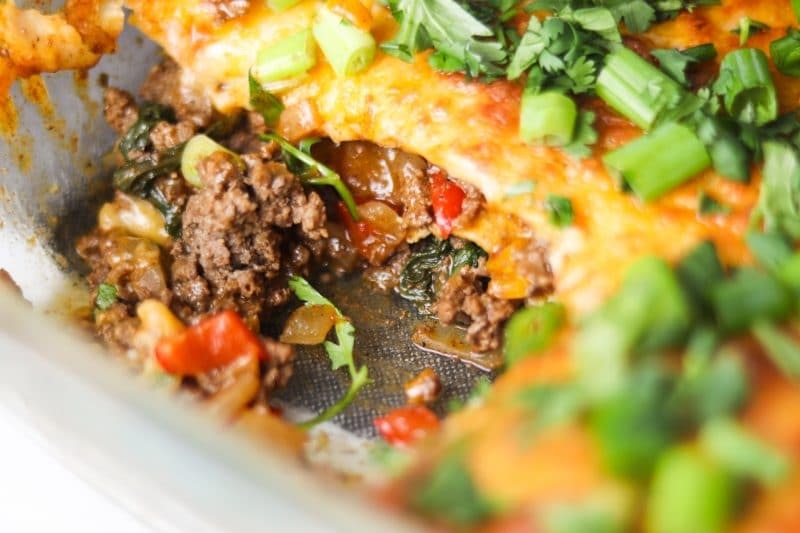 In a baking dish (I used 9×9), rub some olive oil all over the dish and then add some enchilada sauce to the bottom. Put down meat mixture and then top with tortillas. Pour some enchilada sauce over the top and spread it around. 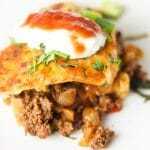 Do another layer of meat and top with tortillas. Add more enchilada sauce. Sprinkle cheese all over the top. Bake in oven for 20 minutes until cheese is melty. You can broil for a few minutes too if you like your cheese with some brown spots (my favorite!). Top with desired toppings such as sour cream, salsa, cilantro, green onion, etc. There are multiple ways to keep this low carb: use low carb lavash bread such as Lavash, use low carb tortillas or use folios. 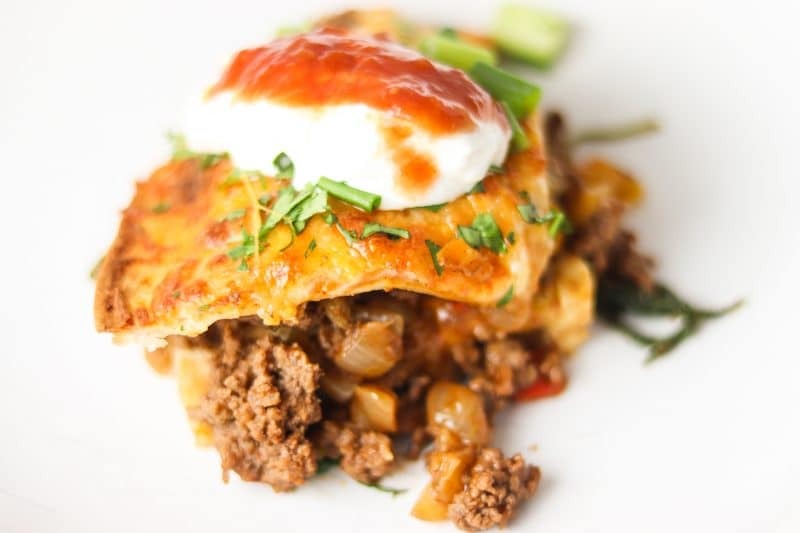 To make this paleo friendly, omit cheese and sour cream. 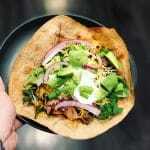 You can use paleo friendly tortillas like Siete tortillas. You could even try using Cauliflower Tortillas. The spinach/kale is optional but I like to add it for an easy way to get in extra veggies. You can’t taste it.